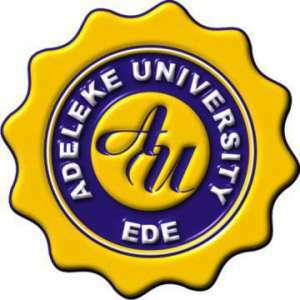 Adeleke University, Ede, Osun Joint Universities Preliminary Examinations Board (JUPEB) and Pre­ Degree Admission Form, Courses, Admission Requirements, Application Costs and Guidelines for 2018/2019 Academic Session. Applications are hereby invited from qualified candidates for admission into 1-year Joint Universities Preliminary Examinations Board (JUPEB) and Pre­ Degree programme of Adeleke University, Ede, Osun State for 2018 / 2019 Academic Session. Our JUPEB programme is designed to prepare students for theexamination conducted by the Joint Universities Preliminary Examinations Board (JUPEB) for 2018/2019 Academic Session. The programme will give students the opportunities to gain admission into 200 Level in our Institution and any other University in Nigeria. Also available is a 1-year Pre­ Degree programme that will prepare students for admission into 100 Level of any of our degree programmes. The Pre­ Degree programme is designed to cater for students with deficiencies in their core subjects. Candidates are required to have a minimum of five (5) credits including English Language, Mathematics, and subjects relevant to course of study obtained at not more than two (2) sittings at the SSCE/ WASCE, GCE or NECO. Candidates with deficiencies in O’Level are also allowed to register for their O’Level Deficiencies. Kindly log on to Adeleke University JUPEB/Pre-Degree portal via http://portal.adelekeuniversity.edu.ng/foundation/. As a “Returning Applicant”, you can make payment (by clicking on “Click here to Pay for your Application Form with a Created Email Address”. You are expected to supply the Email Address registered earlier and the PASSCODE you supplied); you can obtain a Application Form Number(this must be after a successful Application Form Payment); and you can also complete the Application process. After a successful payment, in order to get an Application Form Number, click on “Click here to get a Form Number”. You are expected to supply the Email Address registered earlier and the PASSCODE you supplied. Your Application Form Number will be e-mailed to the supplied email address, and also shown on the screen. To complete the Application Form, you need to have gotten an Application Form number. You are to login with your Application Form number and the PASSCODE earlier created. For further enquiries; visit our website: http://www.adelekeuniversity.edu.ng/ or contact the following numbers: 08034066694.